Not only do we take great care of your car, but we also strive to take great care of the environment. 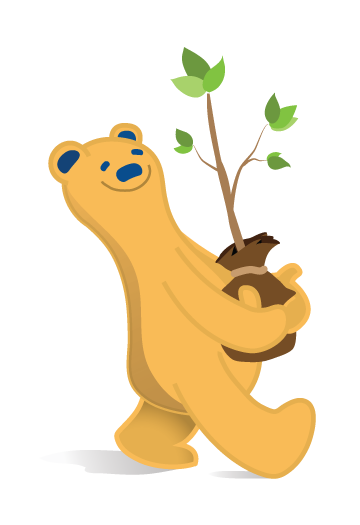 Learn more about why Brown Bear is so green and how washing with us can be good for salmon. When you hand-wash your car, grit and abrasive particles become embedded in the sponge or rag that you use. Over time, this causes microscopic scratches that degrade your car's paint, harming its appearance and impacting resale value. Our carefully maintained equipment reduces the wear and tear on your car's finish that is common with hand washing. In fact, we have a full-time crew of trained maintenance technicians to ensure our equipment is always working at its best! Our specially formulated, environmentally friendly, non-caustic cleaning solutions will get your car sparkling clean, not to mention they are biodegradable and contain no phosphates or caustic solutions. And our car wash equipment delivers the water pressure necessary to rinse away detergent film. At our Tunnel car washes, we can apply Brown Bear EnviroPlate clear coat protectant by Kaady Chemical. This advanced coating creates a deep shine that provides durable protection for your car's clear coat finish. Sponges and rags can easily collect and retain tiny bits of abrasive particles. Accordingly, hand washing can be like taking fine sandpaper to your car's paint. Plus, your garden hose may not produce the volume of water or the pressure needed to rinse away detergents completely. At Brown Bear we use the same methods prescribed in the owner's manuals of leading auto manufactures including Ford, General Motors, BMW, Lexus, Infiniti, Mercedes-Benz, Porsche, Chrysler and others. 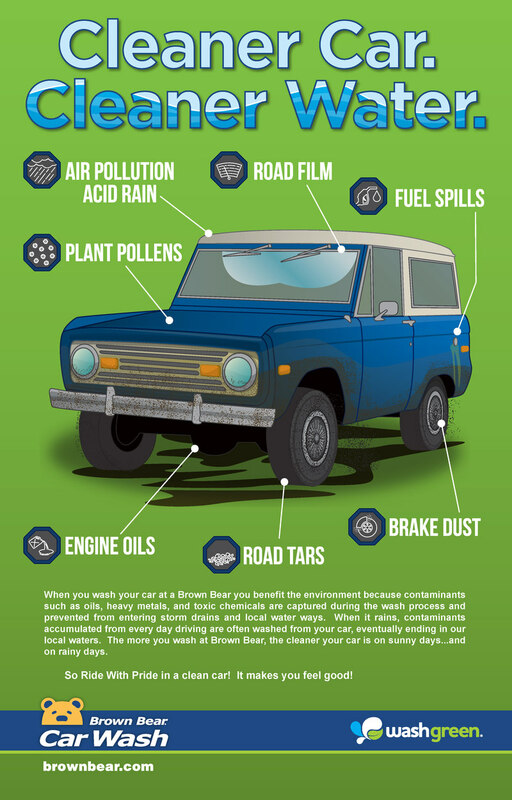 There's a lot of potentially hazardous stuff that can build up on your car—heavy metals, phosphates, motor oil, antifreeze and other hazardous substances. If you are not careful, all of this can go straight into the storm drain system (which doesn't receive any treatment) and in many cases goes directly into Puget Sound and other local waterways and has been proven to harm salmon, trout and other marine life. This is a problem that has been recognized nationwide, and a study by Environmental Partners Inc. confirms that water quality in the Puget Sound region is affected by curbside car washing. We separate road pollutants including oils, heavy metals and antifreeze from the car wash wastewater we discharge. Once we've removed many of the potentially hazardous substances from the water we use, wastewater is then released into the sewer treatment system, not storm water systems, for further cleaning. When you wash your car in your driveway the run off can end up in the storm drain system, where it receives no treatment at all. If this occurs, what comes off your car can end up in local waterways like Lake Washington or Puget Sound. When you wash your car at Brown Bear, we'll safely dispose of the run off for you! 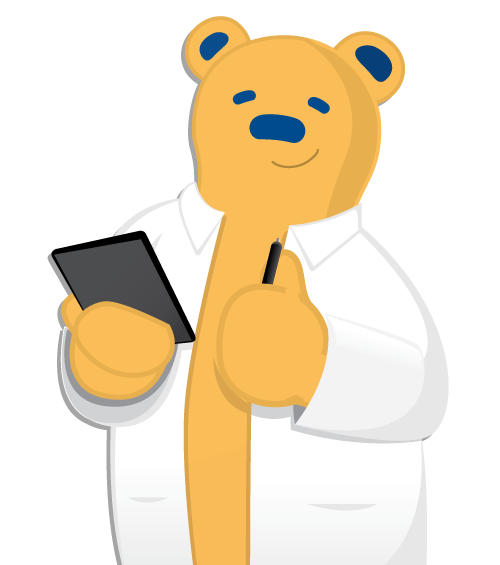 Annual average amount of potentially hazardous sludge that Brown Bear has paid to safely dispose of - almost 5 ounces of sludge for every car washed! Commercial car washing is the "greenest" way to wash your car. Our fine-tuned car wash machinery and pumps are calibrated to deliver the best car wash using the least water. 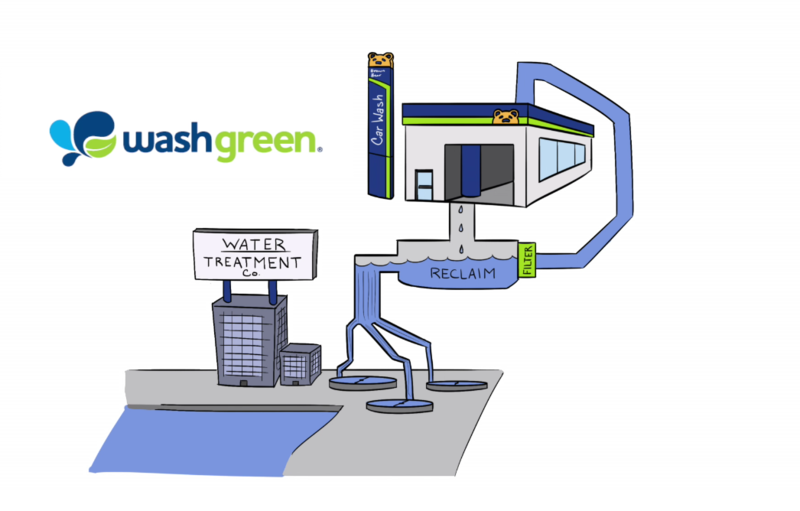 We are constantly improving our car washes, and have recently upgraded our water reclaimation systems to use less and recycle even more water! We are a proud member of the ICA WaterSavers! The WaterSavers® program recognizes professional car washes for water conservation and environmental protection, and is committed to educating consumers about the car wash industry’s environmentally responsible business practices. A large percentage of our water is filtered and resued in subsequent washes. This means we use less water overall, and since it's cleaned before it touches your car, you get the same great clean! Through our innovative techniques, we use an average of no more than 25 gallons of fresh water per car (WaterSavers® benchmarck is 40 gallons or less per car).